Eater National posted an intriguing piece entitled “The 14 Most Expensive Tasting Menus In America” back on January 28th. The feature was authored by Gabe Ulla. Chef Jet and Producer Andy have been fortunate enough to experience a handful of these incredible dining spectaculars. We’ll paint the rarified picture…It’s not for everyone. Forgive us. Heritage breed pigs are the talk of in-the-know chefs these days. We’ll meet the enterprising husband & wife couple behind Cook Pigs Ranch, a noted local producer of “farm to table heritage pigs.” You’ll also learn the intriguing story of a former Bouchon Beverly Hills chef who is soon to open an ambitious artisan butcher shop utilizing Old-World techniques in Santa Ana. We’re journeying to San Diego where an energetic new executive chef is taking a San Diego seafood classic to a higher level with nightly changing tasting menus that are paired with boutique premium wines. The meals are, surprisingly, served with an incredible view of the bay. We’re nuts about coffee on the “SoCal Restaurant Show.” So are our friends at the chef-driven Bruxie, the Belgian waffle sandwich guys. After a lot of research they have recently introduced their own “Bold Blend” custom crafted coffee. It’s a proprietary four-bean blend. Los Angeles has a new food event with celebrity master chefs. It’s the All-Star Chef Classic at L.A. Live. We’ll have a preview. Executive Chef Ivan Flowers in newly arrived and his worthy mission is to add to the achievements of this popular restaurant. His concept is “boat-to-table.” New to the dinner menu options is a very special seven-course tasting menu. Chef Ivan then works with their inspired and talented Sommelier, Anne Estrada, to offer carefully selected boutique wines to compliment each dish. No mass market wines in this cellar…As a package it’s an evening of memorable dining. We’ll be visiting with Chef Flowers to get all the specifics. We’re fans of Bruxie. These are the premium sandwich folks who use a creative version of an authentic Belgian Waffle (they developed the proprietary recipe) as the bread. The waffle is light, airy, crispy and not sweet. Since they opened their first location in a classic former burger stand in Old Towne Orange within walking distance of Chapman University they have quickly grown to a total of six company-owned restaurants! No short cuts with quality ingredients here. Bruxie partner and noted chef, Kelly Mullarney, is truly coffee obsessed. As a side project he set out to create a chef-driven coffee experience that would be bold and complex enough to stand up to, and complement, the flavors on the Bruxie menu. The result is The Bold Blend, a proprietary, four-bean blend of 100 percent fair trade imported coffee beans. It’s now the house blend served at all Bruxies. Members of Chef Michael Puglisi’s immediate family in Sicily are well-known Old World artisan butchers. Starting this summer Chef Puglisi will be using those skills at his own Electric City Butcher Shop which is a major component of Santa Ana’s much –anticipated (and talked about) 4th Street Market Food & Culinary emporium. 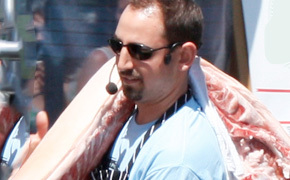 Puglisi was previously the sous chef of Thomas Keller’s Bouchon Beverly Hills. While the build-out of 4th Street Market is going on Chef Puglisi will be honing his hand-made sausage making skills at the just opened Picnik in Old Town Pasadena in partnership with Chef Eduardo Ruiz of Corazon y Miel in Bell. Old World sausage-making traditions will be used. Every gourmet sausage served will be twisted and cased by hand. The Inaugural All-Star Chef Classic at L.A. LIVE, a never-before-seen modern food event bringing together over 25 highly acclaimed chefs from around the country for unique and interactive dining experiences, is set to launch March 21st to 23rd at L.A. Live’s Event Deck. The event is organized by culinary industry veterans and founders of Alice in Events, LLC., Lucy Lean and Krissy Lefebvre. They have partnered with AEG, owners and operators of the downtown Los Angeles Sports and Entertainment District. The three-day event will feature master chefs cooking and collaborating in venues designed to provide guests with up-close, unique and interactive culinary experiences. The grand finale on Sunday, March 23rd from Noon to 2:30 p.m. is “Savor the Season Presented by Melissa’s Produce.” This event will wrap up the enticing weekend with a Farmer’s Market celebration of what LA has in abundance – seasonal , fresh, local ingredients cooked up and elevated to great heights by All-Star Chefs including Wylie Dufresne, Graham Elliot, Nancy Silverton, David Myers, Vinny Dotolo, David LeFevre, Josiah Citrin, and Waylynn Lucas. The chefs will create seasonal dishes using produce from a local purveyor/farmer providing the 600 guests with a variety of tastes as well as recipe cards to prepare each dish at home. Co-Producer/Executive Director Lucy Lean is our guest. Cook Pigs Ranch is a proudly family-owned, farm-to-table operation with a focus on Heritage pigs. The varieties include Red Wattles, GOS, Large Blacks, Berkshires, Durocs, Tamworth, Mulefoot, and crosses of these magnificent breeds. Cooks also raises KuneKune pigs. The ranch is located in Julian, CA, in the Cleveland National Forest, about one hour East of San Diego. Cook Pigs Ranch is not a large commercial farming / ranching business. Instead their goal is to maintain a small and boutique ranching operation which allows their pigs to free-range and grow slowly in a humane and stress-free environment. Krys and Mike Cook are the co-Presidents of Cook Pigs, and they run the day-to-day operations of the ranch. At Cook Pigs Ranch they experience all four seasons. The ranch is situated at approximately 4,200 feet in elevation. The combination of the local environment and Cook’s feed program produces a high quality product very similar to the renown Iberian Pork from Spain & Portugal. At the recent Cochon 555 stop in Los Angeles defending champion Chef Ray Garcia of FIG Restaurant at the Fairmont Miramar Hotel in Santa Monica successfully defended his title once again. He prepared & cooked a Large Black from Cooks Pig Ranch. The Pop-Up Butcher Shop (Lindy & Grundy) @ Cochon 555 used a Berkshire from Cook Pigs Ranch. Cook Pigs Ranch will soon have a retail facility in San Diego ( Kearny Mesa) to serve the public. The Farm Shop at Primal Pastures in Temecula all sells Cook Pigs Ranch meats.